This photo is of the boat moored at Agalimani, and was taken from the track up to the mausolea at Lydae. This photo epitomises the style of holiday. We sailed into the bay, moored, had a swim and lunch. Then we went by Zodiac to the beach, and walked up to Roman remains. 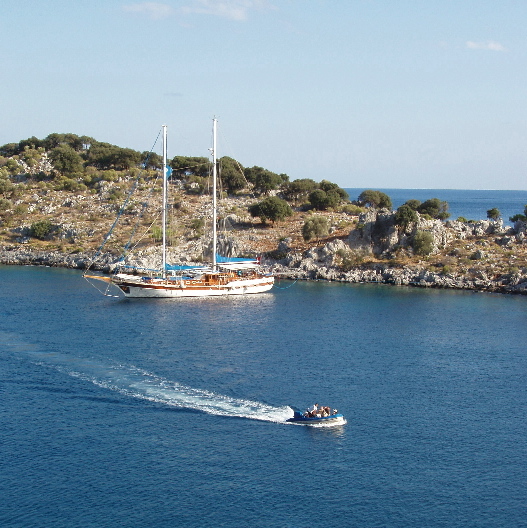 Back to the gulet, we had another swim, supper, and spent the night in this bay. Usually we had a swim before breakfast, and sailed on to our next site after breakfast. Unusually after the night in Agalimani strong winds were forecast, so the captain decided to sail at 6 am, and we had breakfast en route.